Back in October 2015 we posted about a piece of software for the Raspberry Pi called PiTX. PiTX allows you to turn your Raspberry Pi into a fully functional RF transmitter. When combined with an RTL-SDR a full transceiver radio can be built using the QTCSDR software. PiTX works by modulating the GPIO pins on the Pi in such a way that it is able to produce FM modulation. The major problem with using this method of producing radio is that it creates large amounts of harmonics and interference outside of the intended transmit frequency. Interference like this is illegal and could potentially disrupt life critical radio systems such as emergency services, cellphones and air traffic control. In order to cleanly transmit with PiTX an output RF filter should be used. Recently, the team over at TAPR.org have released a 20M WSPR TX filter shield. 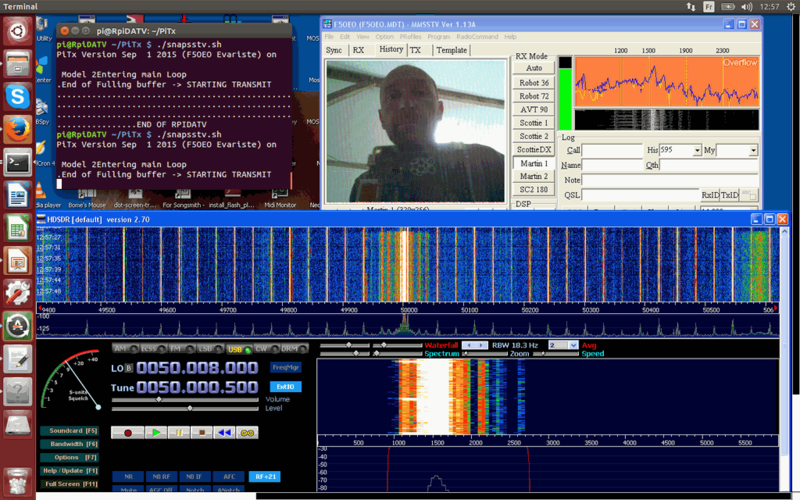 WSPR is pronounced “Whisper” and is short for “Weak Signal Propagation Reporter Network“. It is a type of amateur radio signal that can be broadcast and received around the world by using very low transmit power. Radio amateurs use it to see how far their signal can travel when using very low power (QRP) and to investigate signal propagation conditions. The 20M WSPR shield sells for $20 at www.tapr.org/kits_20M-wspr-pi.html. The WSPR shield sitting on top of a Raspberry Pi. Previously we posted about the Raspberry Pi’s ability to modulate one of its pins to produce FM transmissions with PiFM. 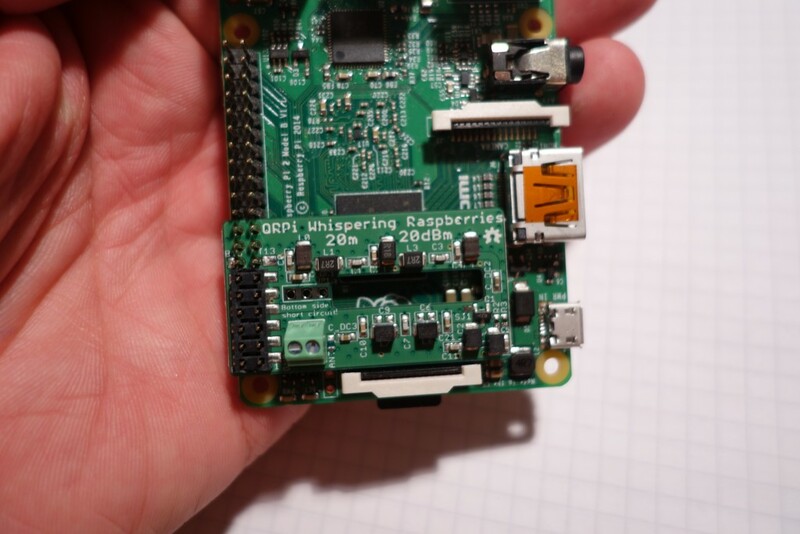 A developer (F5OEO) has recently expanded on this idea, and now the Raspberry Pi is capable of modulating and transmitting FM, AM, SSB, SSTV and FSQ signals anywhere between 130 kHz to 750 MHz. To transmit with the Raspberry Pi all you need to do is plug in a wire antenna to Pin 12 (GPIO 18) on the GPIO port and run the PiTx software by piping in an audio file or image for SSTV. Important Disclaimer: While the output power is very small, you should still take great care as the carrier is a square wave, and there is no filtering on the antenna output. So any transmissions will cause harmonics all across the spectrum – possibly interfering with life critical devices. A filter *must* be used if you actually plan on transmitting with any sort of range further than your room. The predecessor PiFM has been reported to have a range of 10cm without an antenna, so it may be best to not connect an antenna to the pin if just testing. With a simple wire antenna the range is increased to 100m which could affect your neighbours. There are also strict laws and licences governing transmitting in most countries so make sure you follow them carefully. In short, get your ham licence and understand what you are doing before transmitting with any sort of amplification/range. The code for PiTX can be downloaded at https://github.com/F5OEO/rpitx. Also see the authors (@F5OEOEvariste) Twitter account at https://twitter.com/F5OEOEvariste for some more info about PiTX. PiTx is a software which permit to transmit HF directly through a pin of Raspberry Pi GPIO. Unlike PiFM which transmit only in FM, PiTx is able to perform multi modulation (FM,AM,SSB,SSTV,FSQ) : it has an I/Q input to be agnostic. Conclusion : Pitx is now a real TRANSMIT SDR at very low cost. Be aware that it generate lot of harmonics and never compete with USRP or HackRF. Goal is to popularize the transmission as rtlsdr popularize the reception.